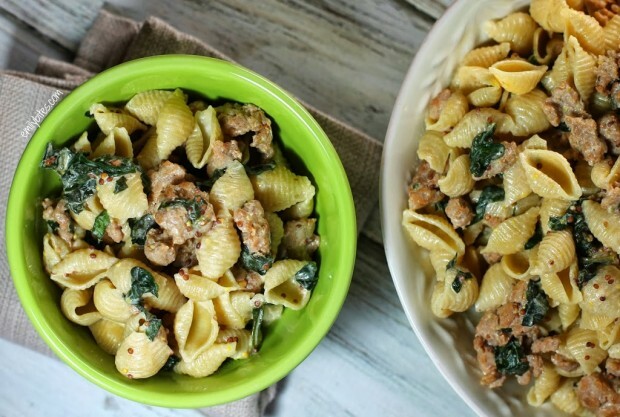 My sister-in-law, Julia, cooked this Food & Wine Creamy Pasta with Sausage & Mustard Seeds for our family when she and my brother were in town for the holidays and it was a huge hit with everyone who tried it. 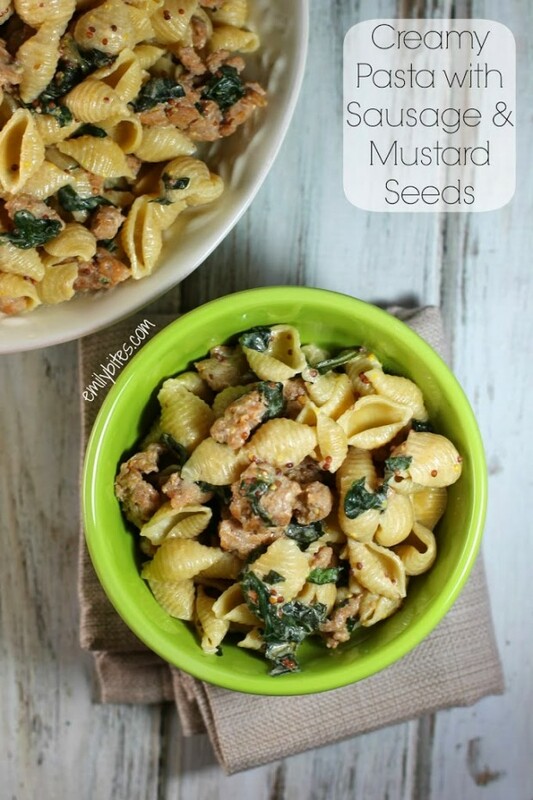 It has a little something for everyone – creamy wine sauce, spicy little kick from the sausage and crushed red pepper flakes, tangy twist from the mustard, sweet herb flavor from the basil and heartiness from the pasta. What’s not to love? Besides being delicious, this dish comes together surprisingly quickly, making it an ideal weeknight dinner option or a great entree idea for company. Toss together a side salad and your meal is served! I added some fresh spinach I had on hand to the mix, but feel free to add more to your liking – I probably will next time I make it (and I will definitely be making it again)! Cook pasta in salted water according to package instructions. Drain and set aside. While the water is boiling for step one, place the oil in a large skillet or saute pan and bring over medium-high heat. Add the sausage and cook for about five minutes or until meat is cooked through, breaking it up into small pieces with a spoon as it cooks. Add the fresh spinach and stir in. Cook for another minute until spinach wilts. Add the wine to the sausage and reduce the heat to a simmer. Stir together, releasing any brown bits from the bottom of the pan and cook for another 5 minutes until the wine is reduced by half. Add the half and half, mustard and crushed red pepper. Stir together and simmer for another 2 minutes. Remove the skillet from heat and stir in the reserved pasta and basil until well combined. Serve. I made this for dinner tonight and it was a hit! Yum! As always, TFS! This looks great! Do the mustard seeds melt or are they like poppy seeds in there that crunch? Poppy seeds are a great comparison, the mustard seeds stay whole and do offer some texture – love it! Long-time reader/lurker, had to comment on this! I made your spicy sausage pasta one night and then this recipe the next, and they were diviiiine. I was able to use most of the half and half I’d bought for both, which was one of those little culinary bonuses. 🙂 My fiance and I gobbled up these dishes like a pair of starving wolves — they are just fantastic and so easy to throw together. Thanks for all your awesomeness! Do you think it would be OK to substitute milk for the half and half? Any suggestions for a substitute for the white wine? If I have an open bottle in my house…I’ll drink it! Use cooking wine. You won’t drink that. Good call! Although my store didn’t differentiate between “dry” white cooking wine or otherwise, so I hope I have the right kind! I just made this dish, and it was wonderful! My family are not fans of spicy sausage, so I used a mild version but added some Franks Hot sauce while the sausage was cooking to give it a little heat. Also, instead of red pepper flakes by themselves I substituted some Kicking Chicken spice by McCormick with red pepper flakes in it. Oh, and I added a whole bag of baby spinach, which my husband loved. Great dish, definitely going to make it again! I made this dish and it seemed a bit too mustardy…any suggestions? I wonder if I didn’t make it if I would even notice the mustard! Thanks for all the great recipes I love them! This was delicious! And there was enough left for tomorrow’s lunch! When do you add the basil? Am I missing something? I just found your blog today and am so excited!! I’ve been doing weight watchers for a couple months now and was in a food rut, this blog is so helpful! Wondering though if you could write what the classic points are for the dishes too. I’m doing the classic versions of ww. I made this for dinner tonight and it was excellent! I am not a huge sausage fan. Do you think this would work with ground turkey?? Thanks. 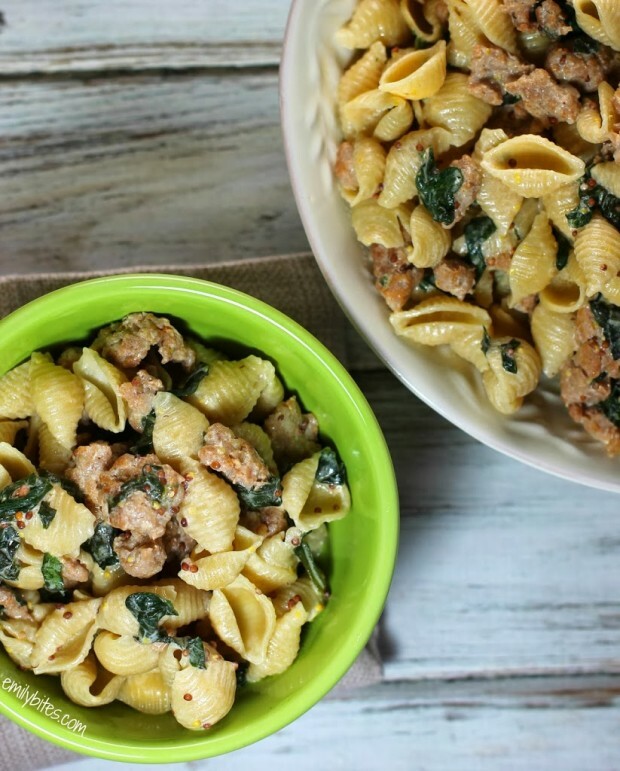 You could certainly use ground turkey, but the sausage adds a lot of flavor so you may want to add seasonings as well. This is literally my kids’ favorite meal, the one they ask for by name. I use the whole bag of spinach and tell the younger one that all the green stuff is basil. (Older son is a teenager and has accepted spinach as a fact of life.) My grocery store doesn’t carry whole wheat shell pasta so I substitute bowties.